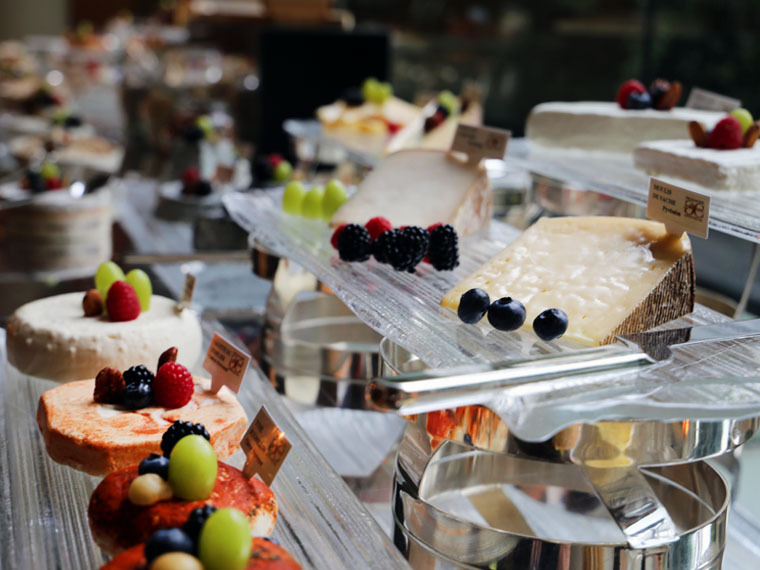 Seasoned foodies and penny pinchers know the secret to buffet dining – skip the carbs, stews and curries and load up on the expensive stuff. And that is exactly what I told my auntie when we went for brunch at the Colony restaurant in the Ritz Carlton Hotel. 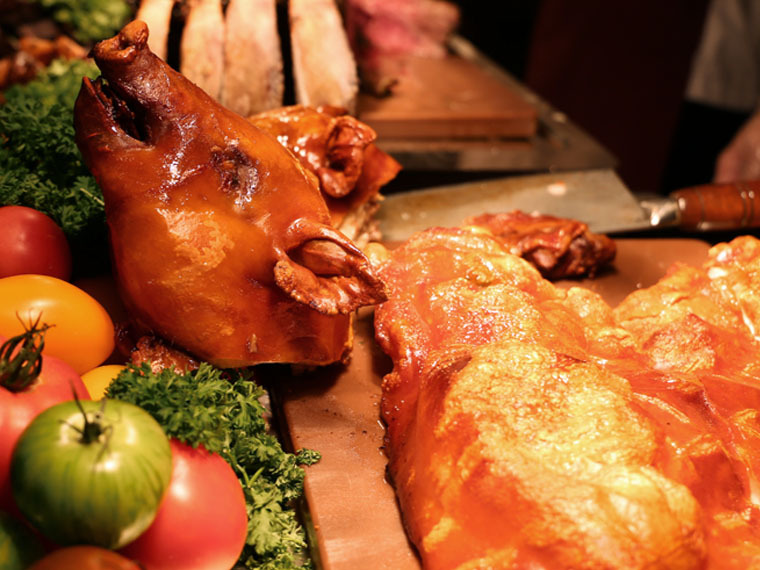 Now, buffet dining is very popular in Singapore but it can be tough to get it right. No single chef or restaurant kitchen can be the expert on preparing multiple cuisines and meal-types. That is why unlimited alcohol and high quality ingredients are integral to the success of a buffet. 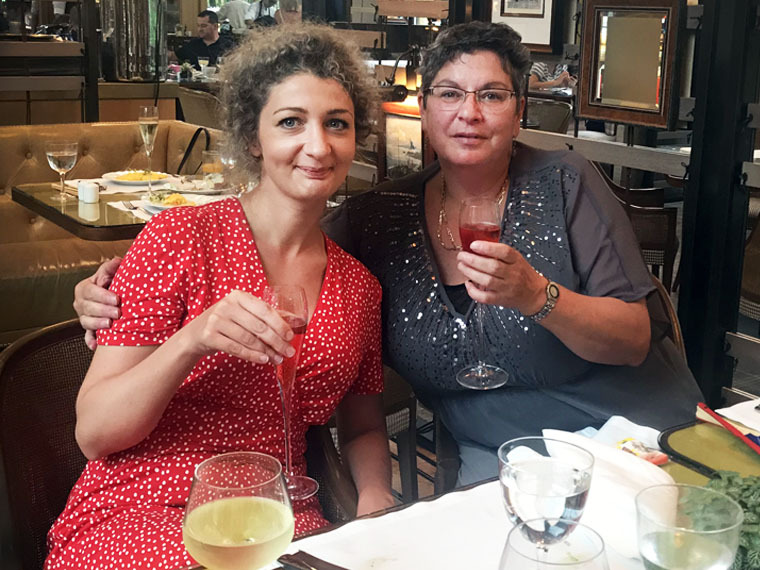 The Vintage Champagne Brunch at Colony restaurant puts on a very fine buffet and they certainly get the alcohol part right. For $192 there is unlimited Barons de Rothschild Reserve Ritz Millesimal and Rose champagnes, which normally cost around $60 a bottle at the supermarket. The Millesimal has a particularly complex yet dry palate that is ideal for pairing with seafood and cheese. Diners can also take advantage of the free flow red and white house wines and draft beer. There is also a Bloody Mary station. Bloody Mary’s are a dying breed of cocktail. They are kept alive only by the older expat women who drink them in reminiscence of bygone times, when they were considered a main source of Vitamin C. Many bars in Singapore have tried to bring back the Bloody Mary by creating modern concoctions such as the Danish Mary, which has the addition of stout and dry spices, or the Ramen Mary, which is shaken with kimchi and egg. I guess young people are just not into vegetable juice. However the Ritz Carlton is a fine establishment that pays homage to tradition so I was delighted to start my buffet lunch with a classic Bloody Mary. I was offered a choice of gin or vodka base, shaken up with thick tomato juice, Worcestershire sauce and plenty of tabasco. My cocktail was served with a paper straw in consideration of the environment, as well as the requisite stick of celery. As mentioned, the second requirement for a good buffet is high quality ingredients. 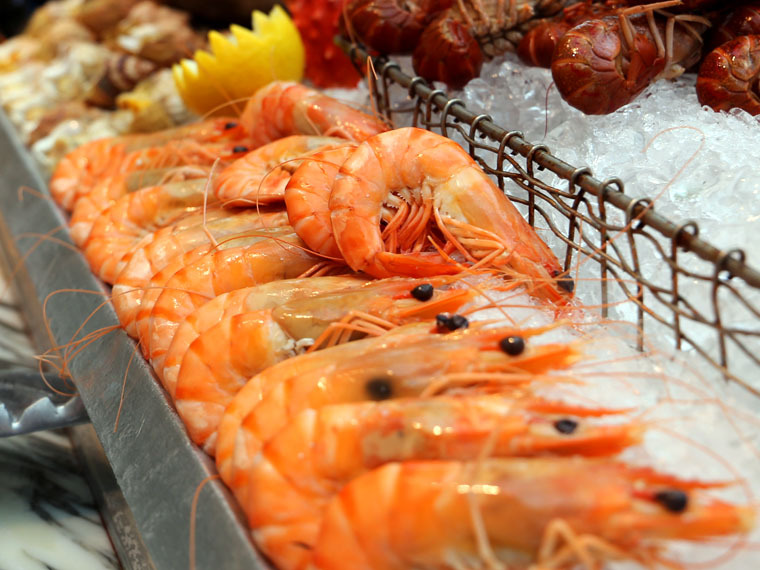 The standard of seafood at the Colony restaurant buffet is very good and superior to most other seafood buffets in Singapore. 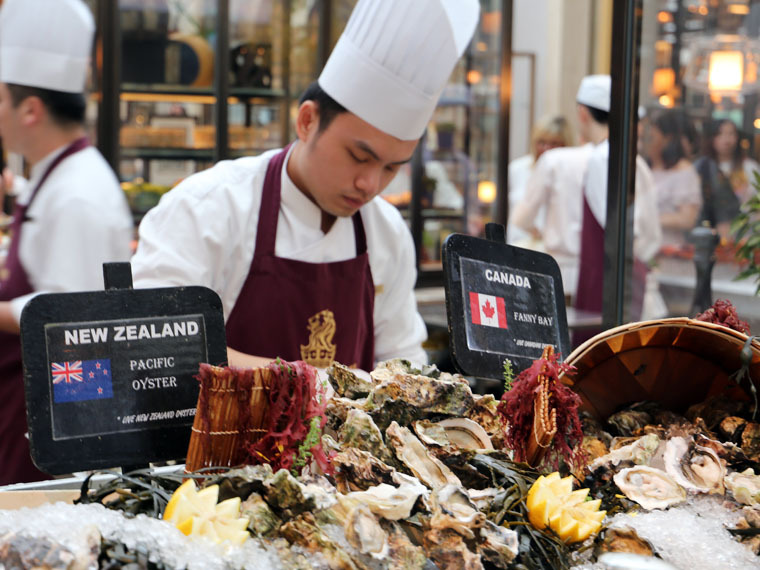 The oysters are the main event, imported from around the world and freshly shucked. I loaded my plate with plenty of Mont Saint Michel from France, which are considered the oyster of choice by bourgeoisie. I enjoyed a momentary feeling of poshness devouring those little suckers. 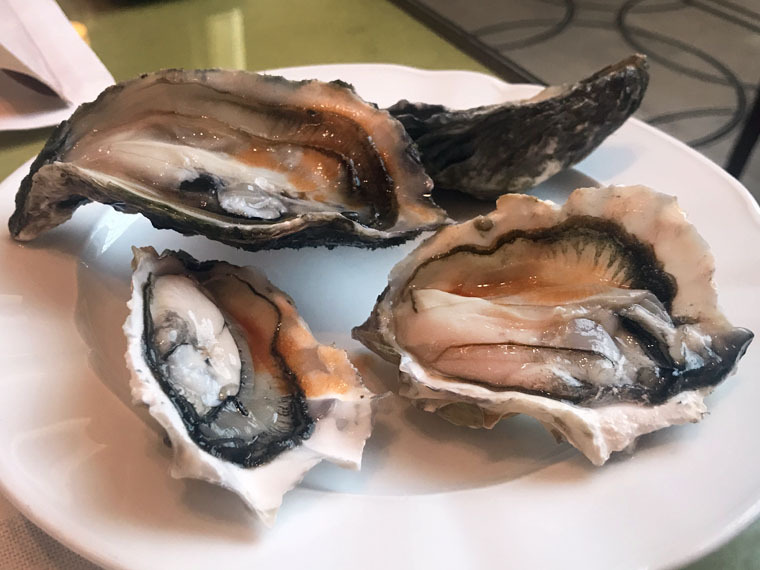 The Fanny Bay oysters from Canada were small yet salty and the pacific oysters from New Zealand were large and creamy. 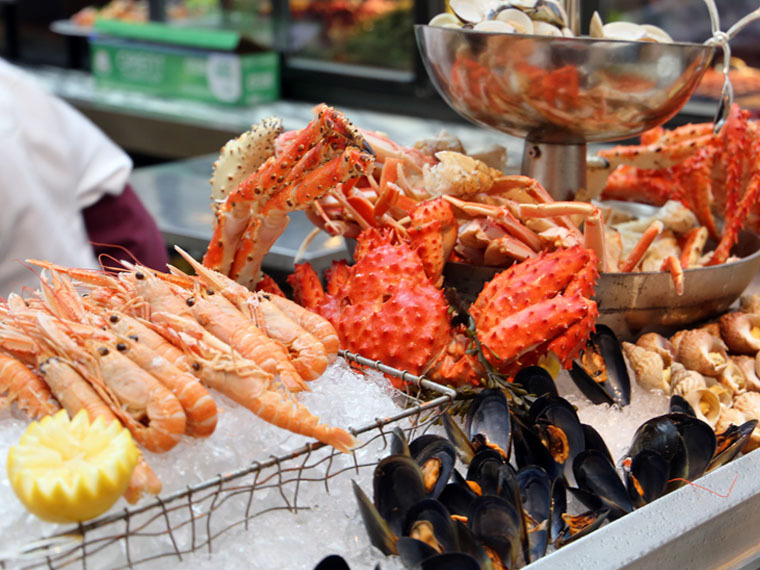 The seafood buffet also boasts other delicious delicacies from under the sea such as fresh prawns, cockles, mussels, langoustines and Alaskan crab legs. I went for several rounds of king prawns with seafood sauce, which are so hard to come by in Singapore. Seafood diet, see food and eat it! The sashimi and sushi section of the seafood buffet was more lacklustre. 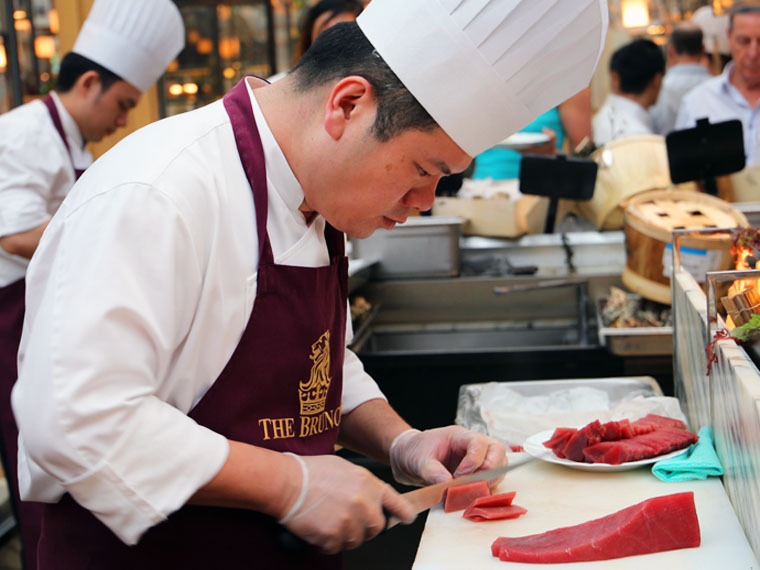 Whilst the sashimi was freshly sliced by one of the Ritz Carlton chefs, the tuna was of inferior quality with almost no fat and a bloody consistency. 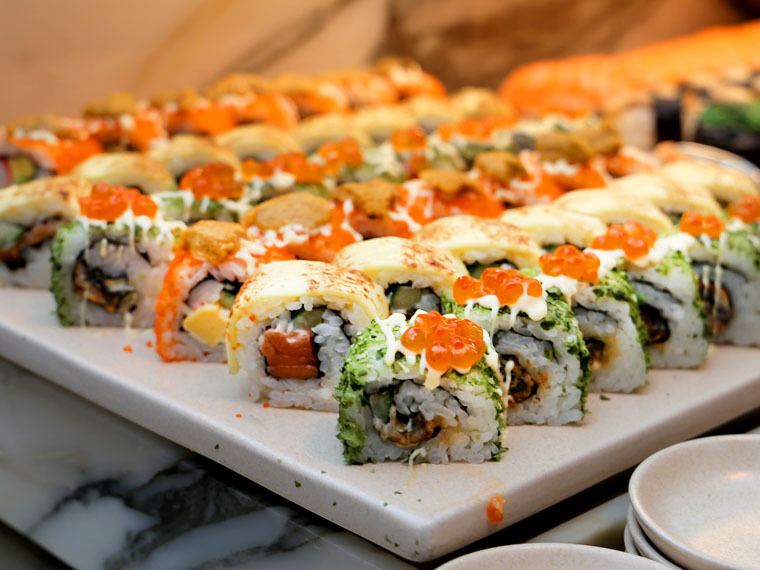 The sushi was prepared in the Western style with avocado, mayonnaise and crab sticks. Whilst I am personally partial to a California roll or two, most Japanese would find the sushi selection here offensive. Adjacent to the seafood bar is the cold meats and salad section. 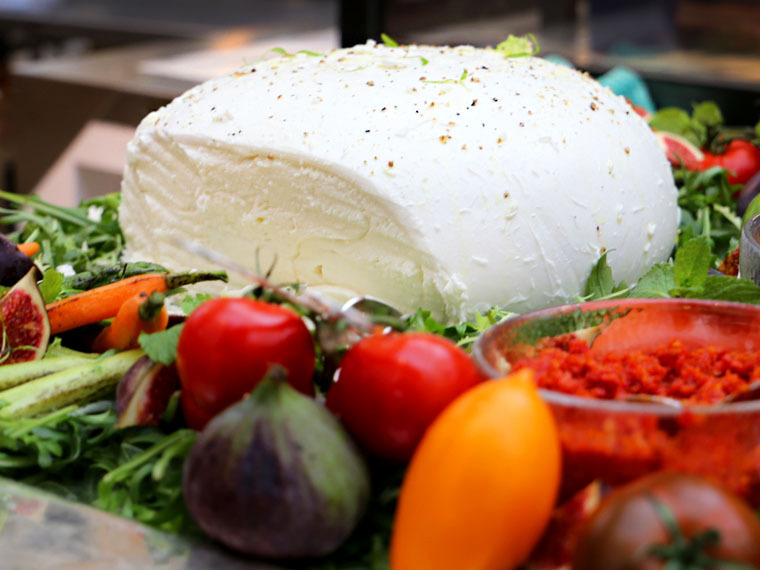 The pride and joy is the gorgeous, milky-white ball of burrata cheese on a bed of rocket, mint, tomatoe and fresh figs. I helped myself to a nice fat slice, drizzled with balsamic cream and olive oil. I skipped past the cured meats and other vegetables, as like I said earlier, there is no point gorging on the primitive foodstuffs. Around the corner from the seafood buffet is the hot section. 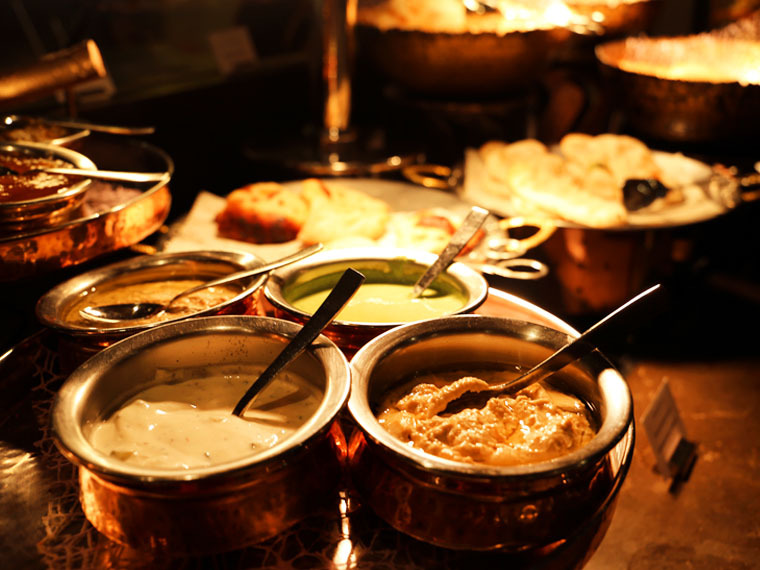 There is a curry station complete with saffron rice, mango pickle, mint yogurt and naan bread as well as a Chinese spread of wontons, noodle soup and stir-fry dishes. However, I was instantly drawn to the roasted meats. A whole suckling pig as well as lamb on the leg and beef tenderloin were on display and I hungrily asked the chef fill my plate with freshly carved meat. 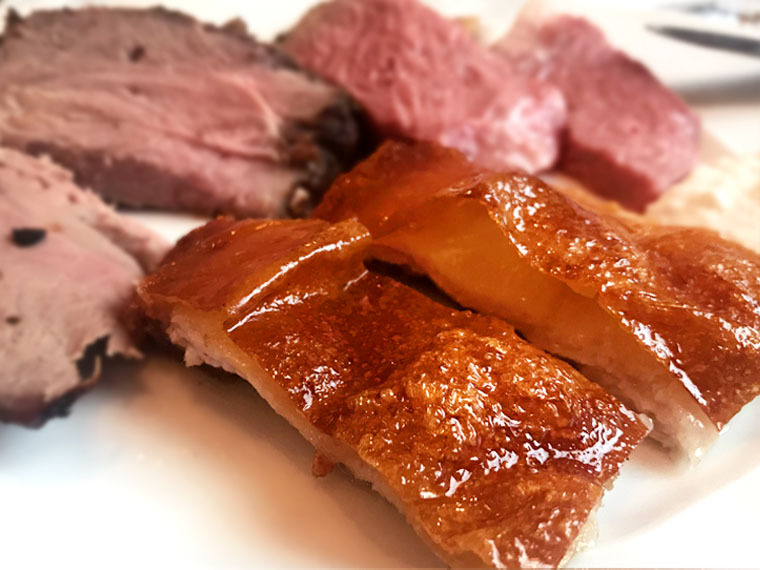 The succulent pork with crispy skin was a delight to savour and the lamb was a perfectly bloody medium rare. If I’m honest, the beef was on the dry side. Condiments included creamy horseradish, chilli and mustard. After having my fill of champagne, fresh seafood and roasted meat I had just enough space for my true love… cheese. This is what sets the Colony restaurant apart from its competitors. Colony boasts a whole corridor dedicated to European cheeses, from soft bries and crumbly blues to hard rind cheddars and tangy chèvre. Cheese lovers will die and go to heaven! A good tip for novices is to avoid the bread and water crackers and eat the cheese on its own. By following this advice, I was able to make three visits to the cheese counter. 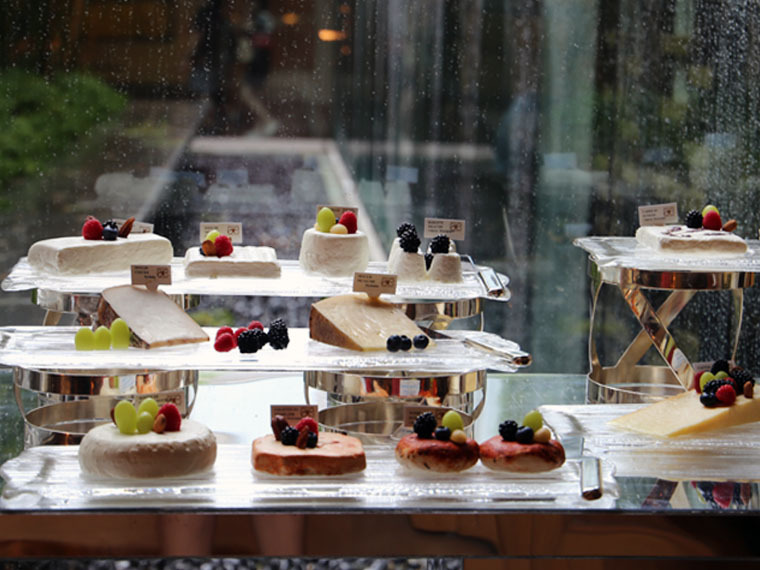 There is a dessert section that has various mousse-type cakes as well as macaroons, waffles and ice cream. But it is nothing more extraordinary than what you can get at your typical expat cafe in Singapore. 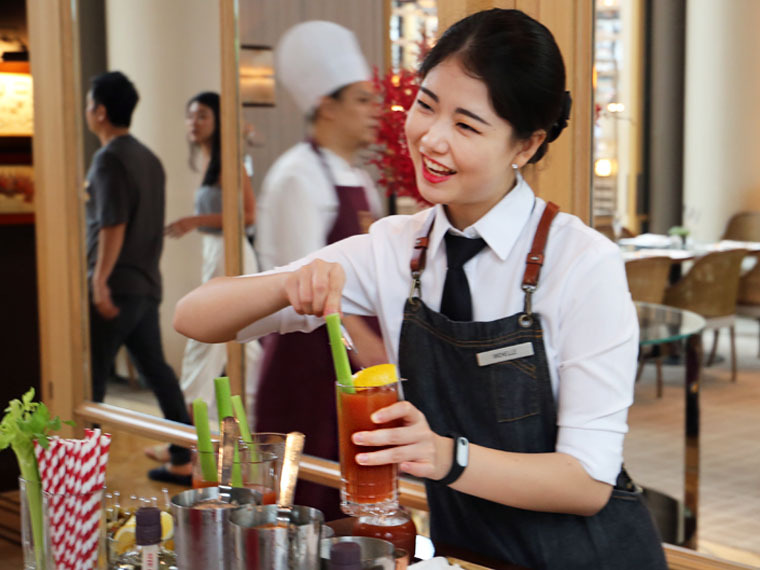 The Vintage Champagne Brunch at Colony restaurant is the most indulgent buffet spread in Singapore and it is superior to the Sunday brunch buffet at the Fullerton Hotel. However you need to be disciplined as well as focused in order to get your value for money. I know this, because I had previous dined at the Colony restaurant with my mum back in 2016 so I was prepared. Start with a Bloody Mary to accompany your oysters and prawns. Then you will want to switch to rose champagne as you tuck into the roasted meats. Finally, a few glasses of classic brut will help the cheese go down a treat. And if you are still walking straight by the time you’re finished, then you didn’t really get your monies worth.